This week edition of Tuesday couch Potatoes hosted by Kikamz, couchers will features movie with Life's Gastronomic Pleasures as theme. 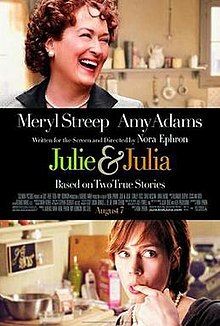 My pick would be this comedy/drama movie Julie & Julia. The film contrasts the life of The French Chef Julia Child in the early years of her culinary career with the life of young New Yorker Julie Powell, who aspires to cook all 524 recipes in Child's cookbook in 365 days, a challenge she described on her popular blog that would make her a published author. Below is the synopsis I got from different source online and movie trailer form YouTube. Synopsis: A frustrated temp secretary (Amy Adams) embarks on a year-long culinary quest to cook all 524 recipes in Julia Child's Mastering the Art of French Cooking. She chronicles her trials and tribulations in a blog that catches on with the food crowd. The film also covers the years Julia Child (Meryl Streep) and her husband Paul (Stanley Tucci) spent in Paris during the 1940s and 1950s, when he was a foreign diplomat who was eventually investigated by Sen. Joseph McCarthy for alleged communist ties. This is one of the movies I would really love to watch. Unfortunately, the DVD copy was way too expensive. ohhh!!! i love it mommy shy!!! ngita ko copy! now na! thanks for sharing the preview. this is a very excellent pick! wow! sounds really REALLY interesting!